From boutique hotels blocks from campus to countryside bed & breakfasts, you will find accommodations in Lancaster County to suit your style and budget. The establishments linked below are convenient to campus and work with the College to offer special rates to F&M visitors. The Restaurants at Ben Franklin offer a plethora of all-you-can-eat deliciousness, including a complete Kosher restaurant, KIVO (Kosher, International, Vegan, Organic). Feel free to ask the admission office for discounted meal coupons. Our retail outlets in the Steinman College Center—Grill Off the Green, Horseshoe Cafe and Simply Salads—offer made-to-order breakfast sandwiches, burgers, grilled sandwiches, flatbread pizza, pasta, homemade soups and a full, self-serve salad bar. 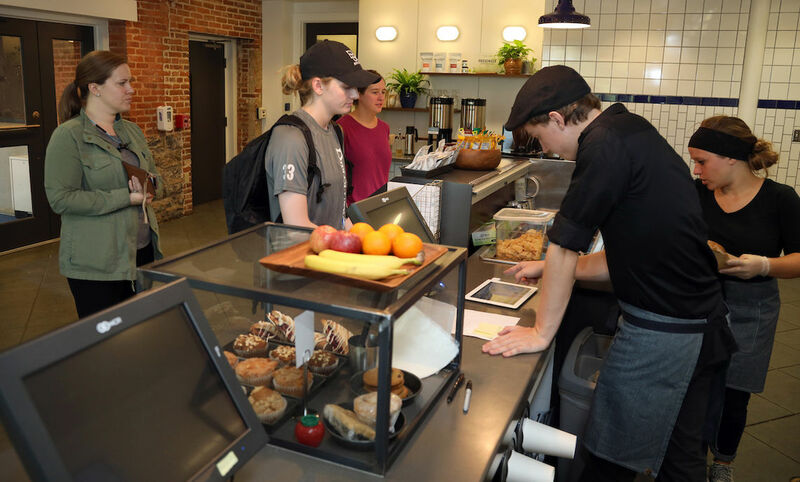 Blue Line is located in Distler House (with the F&M Bookstore) sells fresh, healthy, local food and beverages served quickly in a welcoming environment. It features a rotating selection of locally sourced coffees and teas prepared by professional baristas, alongside an easy-to-understand menu that emphasizes convenience and quality. Flavors at LS&P is located in the Barshinger Life Sciences & Philosophy Building's Atrium and features brewed coffee, breakfast sandwiches, flatbread & baguette sandwiches, gourmet salads and desserts. Asian fusion, brewery, coffee shop, deli, Ethiopian, fine dining—you name the style of eatery, and chances are you can walk to one from F&M! Lancaster city has become one of the nation’s most vital small cities. Find out why. When coming to campus, take time to explore Lancaster City and enjoy some of the unique attractions and top-notch restaurants this area has to offer. Downtown Lancaster is a hub of culture and arts filled with art galleries, historical buildings and hot nightspots. And it's all within walking distance of campus.